Many parents think piano lessons are the start of their child’s musical journey. This article will provide you with some useful tips on activities you can do before your child ‘learns’ piano. Learning a musical instrument is an exciting time in a child’s life, and it can be equally exciting for parents too. You may also find it a bit overwhelming. It’s common to feel the need to ‘get it right’ when it comes to your child’s musical development. This applies regardless of whether you learned piano as a child. Perhaps you learned but didn’t enjoy the experience. Maybe you still play piano and you want your child to develop a similar love of music. Or if you never played piano, knowing how to get it right can seem even more daunting. The first tip is to relax! The best thing you can do for your child is to focus on creating opportunities for them to enjoy the piano. Learning a musical instrument can sometimes be difficult, particularly as children have limited attention spans. This is why it’s important to maintain a sense of fun. It’s this sense of enjoyment that will help them to stick with it over the long-term, but keep in mind everyone’s definition of fun is different. As a child, I didn’t like learning classical pieces. Fortunately my parents were both relaxed and aware enough to appreciate this. I spent the first two years of formal lessons on a digital keyboard learning chords and popular songs. I am immeasurably grateful for this because I was never going to be the child who thrived on learning scales and reading music. In fact, I may well have given it up altogether if that was the case. Instead, because the correct foundations were laid at an early age, I continued to play, perform and write songs throughout my teenage years and now as an adult. Other children are born to perform! I was one of those children who had a very good ear. Later this led me down the path of song writing. 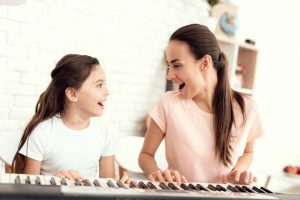 This is why it is important to appreciate your child’s unique musical style before finding them a piano teacher. While the basics of learning piano are essentially the same, there are lots of options to consider. Options like the style of music they will focus on (classical or popular), whether they attend one-on-one tuition or group glasses, to deciding if they will undertake formally recognised graded exams. There are many different paths to learning piano! No matter their age, children have their own unique personality. I found the need to get my son his own Spotify account at the tender age of seven. I was worried he would taint my playlists with his leanings towards hard and classic rock! Before your child learns to play piano, surround them with music. Listen to the radio, share your Spotify or Apple Music collections with them, and you’ll find they start to form their own tastes. Show them YouTube videos of piano performances. If you can, take them to live music from time to time. Young children enjoy concerts aimed at their level, but don’t limit them. We took our son to a Day On The Green when he was eight, and last year it was the Foo Fighters at his request. If this is going to be their instrument of choice, let them have a say in what they will be playing. Obviously older children are going to be better able to communicate their tastes and preferences than pre-school children. Initially I learned on keyboards but later when it came time to buy a piano I had very specific tastes about the tone of the piano and the weight of the keys—some pianos play firmer than others. So don’t forget this is going to be their instrument, not yours (even if you decide to borrow it occasionally). If you have a younger child, it’s best for you to make the decision on their behalf, but there’s no reason why you can’t get your child involved in the buying process. Take them along to the store and let them play the piano you intend to purchase. This way they can get excited about it, as well as develop a sense of ownership in the process. Piano lessons are a must if you want your child to learn the skills to play the piano correctly, however we often forget the power of unstructured learning. This means giving your child an opportunity to ‘play’. With younger children, this could be rhythm and clapping games. Older children can start to learn the language of the piano by showing them octaves and the names of the keys. Have a sing-a-long together. If you’re more outgoing, get up and dance too! At eleven years of age, I was considered a late starter, however looking back I realise my piano lessons started well before this. I’d regularly tinker on my grandmother’s old pianola when we visited her. A good friend would also let me use her piano when I visited and she taught me some basic songs that we played together. By the time I officially took piano lessons, I had already been learning the piano for some time! You can begin the process of getting your child ready to play piano today. It’s as easy as sitting down with them at the piano and having some fun. If you don’t yet have a piano, let them choose a song from your music collection and sing along. Music is a skill that will stay with them for life, particularly if they develop a love for it during childhood.